Philadelphia's welterweight sensation Mike Jones was truly put to the test in his high-profile 10-round bout with Jesus Soto-Karass on the big Manny Pacquiao-Antonio Margarito fight card Saturday. The results were certainly mixed, but the North Philadelphian came away with his undefeated record and championship dreams intact, although it was evident that he may need to cook a little longer before taking on the elite welterweights. Jones started the fight strongly, using his jab to control the action. Soto-Karass was big and strong, but Jones was in charge from the start. MJ followed up in round two with more of the same. For the first half of the round, Jones jabbed and everything was playing out as hoped for. 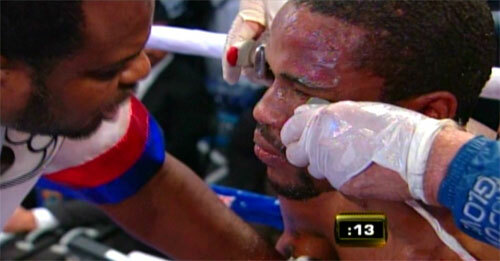 But then, after coming within an inch of an early stoppage, things got interesting. 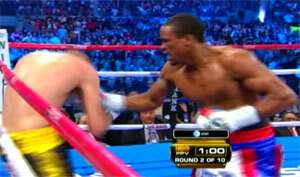 At about the halfway point of round two, Jones rocked his opponent with a right hand along the ropes. He followed with additional shots that stunned Soto-Karass and had him cut. Sensing an opportunity, Jones let fly a wild attack on the sturdy Mexican. This was exactly what Jones, his team, and his big cheering section back in Philly had been hoping for - the perfect chance to score an emphatic KO before the entire boxing world, just minutes before the biggest fight of the year. As the spotlight squinted intensely on Jones and he tried to seize the seemingly tailor-made opportunity, MJ fans collectively scooted to the edge of their seats to watch their man make his statement. Russell Peltz, the uncanny matchmaker extraordinaire who had carefully and nervously plotted Jones' five year climb up the ranks, couldn't have planned this one better if he'd written it himself. So the strong and silent Jones, the man who never shows emotion or feels the pressure, finally cracked. He exploded not only with punches but with true excitement and real feeling. Jones let loose an attack that said "he's all mine". 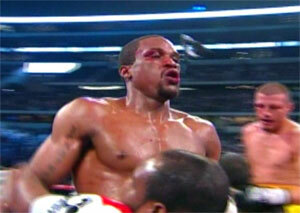 He jumped on Soto-Karass and fired punch after punch. Some landed; some missed as the barrage continued. For the first several seconds of the onslaught, it seemed like the exact right move by Jones. But as they say, there can be too much of a good thing. Instead of sitting back, picking his shots and asserting a more effective attack, Jones fired with abandon, and in doing so made a big mistake. 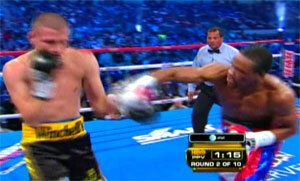 The punches, fierce at first, lost their sting as Jones' body language changed from destruction to desperation. Eventually the bombs lost their snap as Jones punched himself out. He stopped throwing with about 30 seconds remaining in the round. Soto-Karass fought back and it was clear that Jones was exhausted. Mike managed a few more punches, but he and his fans were happy to hear the bell. For the next four rounds, Soto-Karass not only controlled the fight, he appeared to have a chance for a stoppage. It was an excruciating four rounds to watch. Jones had no legs. He was in retreat mode. He couldn't fire back. And worst of all, when Soto-Karass landed, Jones slumped back to the ropes for a breather. He looked like a beaten fighter. His face was lumpy and nicked. 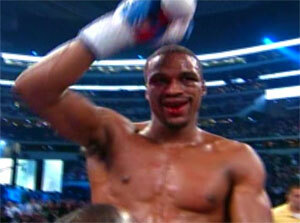 However, beginning in round seven, Jones started showing signs of life. In that round, Jones probably did enough to win but he was still in recovery mode, and his reemerging offense was offset with far too much backing up, resting, and a worried body language. But for his fans, it was enough. It was a glimmer of hope that things would not come crashing down. By round eight, Jones had his wind back and regained control of the fight. Although the exchanges were two way - all the way to the end - Jones didn't look like a world-beater. But he was winning rounds again. He won rounds eight and nine. On the broadcast scorecard, Harold Letterman had it five rounds for Soto-Karass and four rounds for Jones. In the corner before the tenth final round, Jones trainer Vaughn Jackson implored his charge to fight. "You need this round! Wake Up!" Jackson was exactly right. To his credit, Jones went out, took the last round and looked pretty good doing it. Winning the tenth gave Jones a draw on Letterman's card (95-95), with the first two and the last three rounds in his column. The official scores almost got it correct. Judge Gale Van Hoy called it a 94-94 draw. Levi Martinez had it 95-94 for Jones. Given the closeness of the bout, one couldn't argue with either tally. However, judge Sergio Caiz scored it 97-93 for Jones. That's just crazy. With the majority decision win, Jones improved to 23-0 with 18 KOs, retained his NABA & NABO titles, and won the WBC Continental Americas belt. Soto-Karass fell to 24-5-3 with16 KOs. By awarding Soto-Karass the pivotal seventh round, I too had the fight a draw at 95-95. This tough night for Jones told many tales. But the bottom line was that Mike Jones came away with the victory. He also displayed a toughness that before now, we could only wonder about. When a rising star has everything is his favor - a solid team, good press, favorable match-making, an avid fan base, and a reputation as the heir apparent to Philadelphia greatness - he sometimes gets away with a lot. All that attention can make a boxer spoiled. And being spoiled can let a fighter down in the heat of the battle. For five years now, I've wondered if this was the case with Mike Jones. He's had moments of difficulty, but never a life and death struggle. This was pretty close to that. In my opinion, Mike Jones passed the toughness test. He showed a desire to win and an ability to persevere. It was the type of nightmare that builds character and can help turn a decent fighter into a good one. It was the type of fight he needed, but one wonders if it came at the right time. With the whole world watching, Jones looked rough. He proved himself to be tough enough, but raised questions about whether he is good enough. Soto-Karass is a tough opponent who has served as a measuring stick for other good up and comers, but he is not in the same league as the upper tier of the welterweight division. If on this night, Jones had faced Andre Berto or one of the other champs at 147, he probably would have lost and lost big. But let's not forget, Jones was not matched with one of those guys. He was matched with an opponent who was able to test the limit of what Jones had to offer. That's the magic of matchmaking. Jones almost failed, but he didn't. He could have fallen; he could have quit; he could have failed to close the show. But he didn't. He lasted and he did enough to squeak out the decision. That he had to struggle and show his limitations before his biggest audience thus far, was a cruel tweak of reality. But that is boxing. And to be honest, I'm tired of puffed up undefeated records and airs of invincibility. I want to know the problems areas of my favorite fighters so I can notice signs of improvement. Jones showed a number of weaknesses Saturday night, including the inexperience that led him to punch himself out instead of scoring a spectacular knockout. I don't know for sure if Jones will become world champion, but I'm quite sure he won't make that same near-fatal mistake again. That's what climbing to the top is supposed to be about - learning and improving. And so on what many are calling a bad night, Jones took a very real step forward in his progression. The only thing that took a permanent hit was the thought that Jones is unbeatable. But real boxing fans know that no fighter is invincible. The best boxers are molded by hard work and real experience under the glare of expectation. Mike Jones might have a way to go before he's ready for the very best welterweights, but after this life lesson, he's moved a little closer.